For those of you who like to create sounds and want an old school synth vibe, then this is for you. 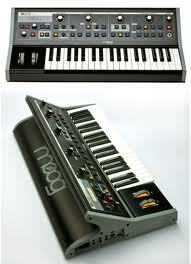 The Moog Little Phatty 2 Synthesizer is fully MIDI compatible. It has a 100% analog signal with the ability of digital control. This powerful keyboard has everything from booming and punchy basses to evolving swells and leads and everything in between. It also has some really sweet blue LEDS that is the icing on the cake. I bought this synth and I am extremely pleased with it. If you want a different sound to your music instead of the typical digitally sampled sounds, then try this out. You can get it at Guitar Center for $1300.00. Use the link below for exclusive deals. Dimensions: 26.75"W x 6.75"H x 14.75"